If you've already jotted down an outline of your presentation in Word and now need a quick way to add it to your slides, you can import a Word outline into PowerPoint. If your document has headings (any heading levels from H1-H9), you’ll see those headings organized by level. In the Outline Level box, select a heading Level 1 for slide titles, Level 2 for bullet points on that slide. When finished or to edit your document, select Close Outline View. If you need help creating an outline, see Create an outline from scratch in Word. To save your document, select Save, name your file, and then select Save once more. Select Close to close your document. Note: Your Word document must be closed to insert it into a PowerPoint presentation. Open PowerPoint, and select Home > New Slide. In the Insert Outline dialog box, find and select your Word outline and select Insert. Note: If your Word document contains no Heading 1 or Heading 2 styles, PowerPoint will create a slide for each paragraph in your content. PowerPoint can import an outline in .docx, .rtf, or .txt format. If your outline is a .txt file Use indentation to indicate heading levels. Any unindented lines of text will become titles of new slides. Save the Word document as an .rtf file. In PowerPoint for macOS, you can only import Word documents that are saved in Rich Text Format. Click File > Save As, and in the File Format box, select Rich Text Format (.rft)). If your outline is a .txt file: Use indents to indicate heading levels. Remember that any unindented lines of text will become titles of new slides. In a new PowerPoint presentation file, click the first slide. Or, in an existing presentation file, click the slide that you want the outline to appear after. On the Home tab, click the arrow next to New Slide, and then click Outline. 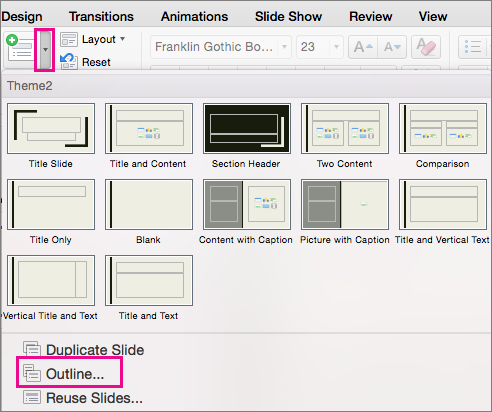 Note: In PowerPoint for Mac 2011, the Outline option is called Insert Slides from Outline. Locate the outline file (.rtf or .txt) that you want to insert, and then double-click it or click Insert. New slides are inserted in the presentation based on the text in the outline file you selected. You are now ready to edit the slides and the presentation as you see fit. Creating a presentation from an outline isn't support in PowerPoint Online. It requires a desktop version of PowerPoint.